Things go from bad to worse when Mr Punch has a fight with Toby the dog. In all the confusion he rather foolishly forgets his childminding duties and now the baby has gone missing. Punch and Judy an hilarious slapstick romp for the whole family, comedy suspense and plenty of knockabout drama. Mr Punch has been entertaining families for 353 years and counting. There is no doubt about it Punch & Judy - the greatest puppet show on earth! A Punch and Judy show, is the greatest of all puppet shows. It has entertained both adults and children for generations Family entertainment at it's finest! The instantly recognisable and classic red and white striped canvas theatre is fully amplified and can be set up either indoors or outdoors. 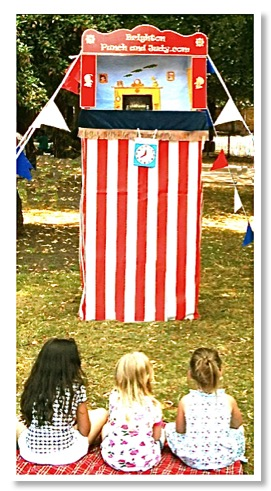 Punch and Judy hire in London, North London, South London and also Punch and judy booking and hire for East London and West London. 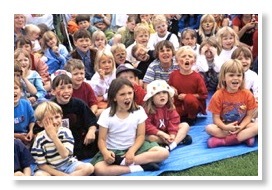 We also perform our Punch and judy show in Kent, Punch and Judy in Hampshire and Punch and Judy in Surrey.